← Why Are We Still Making Buildings Without a 13th Floor? Overall job growth in downtown Seattle is twice that of the region as a whole: 243,995 Seattleites work downtown. 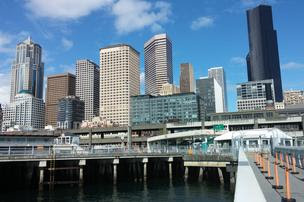 Nearly 65,000 people live in downtown Seattle. Almost a quarter-of-a-million people work downtown every day. Fifteen million square feet of office space is under development. Simply put, downtown Seattle is booming. The Downtown Seattle Association presented its 2015 State of Downtown report Wednesday at an event heavily attended by public officials and business executives. DSA President and CEO Jon Scholeshighlighted the association’s focus on public safety and residential development. Scholes has a lot to live up to as the new head of the DSA after business favorite Kate Joncas departed to become deputy mayor last summer. Scholes’ plans to make downtown a safer, more accessible place to live and work received several rounds of applause Wednesday. “Downtown has added approximately 25 new jobs each day,” he said. The report shows – no surprise – that commercial real estate construction is booming. Amazon alone has plans to occupy 10 million square feet. One of the most telling numbers from Wednesday’s presentation was downtown’s residential population increase. Downtown’s permanent population has increased 8 percent since 2010 to 65,000 people. That number is expected to increase 10 percent more in five years. About 2,700 of those residents are children, a good sign that the population will continue increasing in the neighborhood. The number of occupied apartments and condos has shot up even faster — there are now 12,000 condos and 33,000 apartment units in the neighborhood. But not for long. More than 3,000 units are under construction this year, and about 2,650 more are planned for 2016. Fifty-six new residential buildings are either planned, under construction or recently completed, Scholes said. The organization is partnering with the city to increase public safety and tackle the homelessness issue that pervades downtown. Here are five other key things to know from the 2015 State of Downtown Economic Report. 2. Restaurant sales are up 31 percent over the last five years and the number of restaurants and bars have increased 20 percent. “All this gluttony is just fine as the number of gyms have doubled in the last five years,” Scholes joked. 3. Sixty-nine percent of downtown employees commute using public transit and other methods besides driving, up from 50 percent in 2000. 4. “Seattle is a city full of great designers and architects,” Scholes said. “You wouldn’t know that by peering outside at our sidewalks and parks at times.” The DSA is pushing initiatives to improve and update public spaces. 5. The overall job growth in downtown is twice that of the region as a whole: 243,995 Seattleites work downtown.